How I often cook is not in the bloggy fashion. Sometimes, I simply cook. By which I mean I don’t always follow recipes, or measure, or remember exactly how I made a dish from one time to the next (writing things down is a habit I cultivated solely for the blog), and even if I did remember it wouldn’t matter all that much because whim and what happens to be available play a huge role in what ends up on the plate. No, how I cook is often more like that last sentence: ambling where the fancy takes me, but ending up more or less where I planned to be. I’ve spoken before about how cooking is my therapy. It lifts my mood, brightens my spirit and provides almost endless satisfaction. There’s something about any creative process that nourishes my soul, and who can’t use a little of that? I have my share of kitchen detours and misadventures, and can get as frustrated as the next person, but on the best days I can see the humour in what goes awry. After all, putting cookies in the oven and setting the timer for nine hours instead of nine minutes does have a funny side, at least once the smoke has cleared. As a food blogger, I strive to develop accurate recipes with precise measures and descriptive instructions. I’ll still be doing that, but I’ve decided also to write some posts that are more descriptive of my everyday, not-generally-intended-for-blogging cooking style. I’m calling this series Freestyle Kitchen. These posts will be more narrative, loosely chronicling the free-form way a meal comes together chez moi. In keeping, the photography may be only an iPhone photo or two. So, put on something comfy, grab a beer or a glass of wine or a kale smoothie, and pull up a chair. Let’s chat while I cook. Put your feet up if you like. After all, this is just me, unencumbered, feeling good in the kitchen. False modesty not really being my thing, I’m just going to put it right out there: I had a stroke of brilliance in the kitchen the other day. I’d known for days what I was going to make for dinner, ever since I went all Little House on the Prairie and actually poached a chicken, making my own stock and garnering quite a few cups of chopped chicken meat in the process. My vision was a tomato sauce with chicken, served over pasta. After spending the afternoon writing, except for an hour at the physiotherapist getting my shoulder unstuck, I was ready for a little culinary rehab. When the Culinary Enthusiast got home from work, I got out the chopping board and ever so casually, while we were catching up over a glass of wine, got dinner going. I chopped an onion, a couple cloves of garlic, a few inches of red chill pepper, and the heart of a head of celery that was starting to go limp. There were lots of celery leaves, which I like ever so much. I added freshly ground pepper with abandon and a restrained amount of salt (kosher, of course). After heating a good slosh of olive oil in my large skillet, I stirred the veggies over medium high heat until they were starting to soften. After that a couple cups of cubed cooked chicken joined the party. My idea was to caramelize it, but that didn’t happen (and it didn’t really matter). A couple slugs of the nice red wine that we were drinking went in next, followed by a tin of good San Marzano tomatoes. It was worth the cost to splurge out on this one ingredient; their quality and the texture of their sauce really does make a difference. Next to get thrown into the pot was a good amount of dried oregano and basil, followed by the leaves from a bunch of thyme sprigs. Measurements were by the tried and (mostly) true eyeball method. It was while all this was cooking over a simmer for about 30 minutes that I came to the realization that I simply didn’t feel like making a pasta. It just felt like too much work, involving yet another big pot, and we were leaving for a movie in an hour. So, I let the sauce cook down a fair bit, then drained a can of cannellini beans and added them to the pan along with a big handful of chopped parsley. Of course, along the way there’d been tasting going on, with some more pepper being added. Because of the sweet blandness of the beans I threw in a little more salt too. It took about 10 minutes more to heat the beans through. 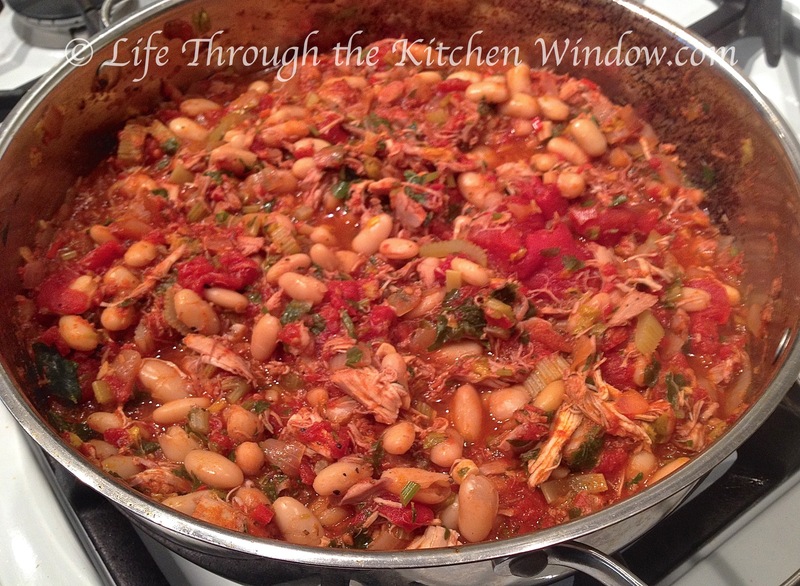 Voila, we had hearty, rustic plates of chicken, tomatoes and bean saucy goodness for our dinner. It was so satisfying. What can I say, I was super pleased with myself for coming up with this alternative to a traditional pasta and sauce. It’s not that I’ve invented beans in a tomato sauce (c’mon, you didn’t’ really think that, right? ); rather, by not encumbering myself with the rigidity of a recipe, I was able to improvise at a crucial point in the cooking process and take the meal in a different direction than originally planned. That’s the way I do it many times…just throw things together. Works for me!!! I hope my blog gives people the confidence to do this kind of intuitive cooking — recipes have their place, but aren’t always necessary. I think many of us cook this way! Yeah, you! That’s truly inspired cooking. I had a similar inspiration, years ago, beans were also involved. Similar to your recipe, but including potatoes and sausage. You’ve reminded me to go back to that…. I’m so glad to hear my post has reminded you of an old favourite dish and inspired you to go back to it. I love it when that happens when I’m reading someone else’s blog. It’s easy to forget all about a favoured dish, and a delight to rediscover it! Oh, yes, I know that feeling of having had a great meal and realizing I forgot to capture it in photographs. Was there wine involved or not? I’ll leave you to ponder that. Well then, it’ll be on the menu again soon! Thanks so much, John. Of course, the ease with which you naturally cook is what most people aspire to. All that note-taking is definitely a learned skill! I’ve also gotten most of the way through a recipe before realizing I hadn’t been measuring. One of the hardest for me still is the amount of pepper I grind into things. I’ve even measured out how many teaspoons I get from so many turns of the grinder, but still I forget. So, this new series is a treat to write. It’s how I cook, with the assumption that the reader will know how to add pepper to taste, etc. And for my ‘normal’ posts, I’m still measuring and taking notes (or desperately trying to remember after the fact, LOL). I can’t tell you how many recipes I’ve made for the blog measuring all the ingredients carefully but after tasting for additional seasoning, I add them without measuring. 🙂 Your dish sounds great…I can’t tell you how many dishes I prepare with beans instead of pasta like you have done. Yes, it’s a challenge for intuitive cooks to stop and measure, isn’t it! My other challenge is thinking I’ll remember just how I made something, and then drawing a blank when I come to write about it. Live and learn, I’m getting better! Beans do make a great substitute for pasta don’t they.